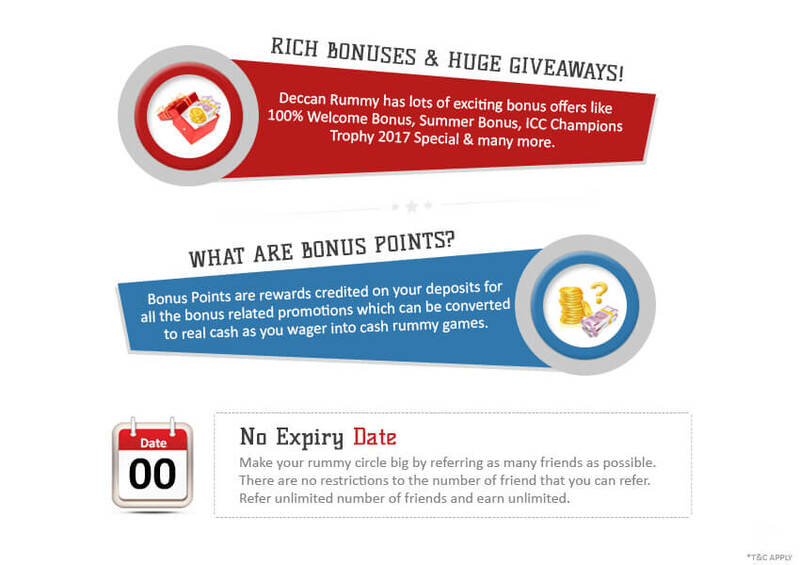 One player can have only one account on Deccanrummy.com. If multiple accounts are detected, the entire bonus amount shall be forfeited. *Standard Deccan Rummy terms and condition apply. Eg: According to our welcome bonus offer, If you deposit Rs. 5000 to your account, then your account will be credited with (5000*10) = 50000 Bonus Points. Sounds like a good deal? We’ll double your first deposit for even more chances to play and win! You can redeem the bonus points at the rate of 1000 Bonus Points = Rs. 100.